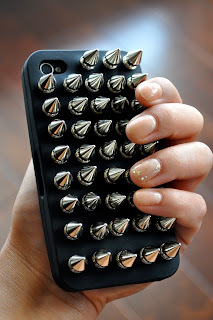 So I am absolutely obsessed with studs and spikes and when I saw the idea of a spiked phone case I had to try it! 1. First, order 1/2" tree spikes from either studs and spikes or any other place you can find them. All you have to do is screw them in. 2. Then, order off of amazon or ebay a plain black silicon iphone case. They are super cheap, no more than 4dollars. 3.Then, line up and arrange the studs on the case how you want them to be. You will need a total of 43 studs. 4.After you should take a pen and mark where the spots are. 5.Then, puncture holes through the case using whatever tool works best for you. 6.Then put the screws in and make sure they are screwed together nice and tightly. There you have it, an awesome spiked phone! From my experience with this case, i've learned it is an excellent conversation starter. interesting idea! I like the textured look it brings to an everyday item like an iphone case. Great work!